Are you dating as a single mom? If you’ve recently decided to dip your toes back into the dating pool, you may feel intimidated. That’s completely understandable. But don’t allow your reticence to keep you from exploring a new romantic chapter. Below are 8 things to know as you embark on a new dating journey. What used to be the exception is now the norm. If you are raising children alone or sharing custody with an ex-spouse, you are not alone. Western cultures tend to have higher divorce rates. In the United States, nearly half of all marriages end in divorce. And single mothers comprise a large number of households. According to the U.S. Census Bureau, over 80% of single-parent households are headed by mothers. Don’t feel alone as you get back out there in the dating world. You have plenty of allies when it comes to dating as a single mom. Even when the dissolution of a marriage is amicable, divorce is one of the most emotionally taxing things someone can go through when it comes to relationships. If you’re divorced, don’t dive back into the dating world until you are sure you have properly healed from the divorce. Not everyone is on the same timetable when it comes to grieving the end of a marriage. You and your ex-spouse will likely experience emotional ups and downs during the divorce process. Allow yourself to grieve, lean on family and friends, and don’t worry about rushing back into the dating scene. It’s also wise to put off dating while you are separated from your spouse. Wait until the divorce is finalized. Why? If you are legally separated, you are still technically married by law, even if you have moved forward emotionally. In certain states, there can be legal implications if you choose to pursue a romantic relationship during a separation. When it comes to the world of online dating, there are a plethora of options. You have your free dating apps like Tinder, Bumble and Hinge; you also have a selection of dating websites (both free and fee-based) like Match, eHarmony, and OkCupid. Online dating is a great tool for meeting people you wouldn’t run into otherwise. And when it comes to dating as a single mom, you have limited time to run about town to meet someone. However, it’s important to note that not all online dating options are created equal. For example, Tinder — the app that bore the age of “swiping right” — has garnered a reputation as more of a hookup app. (Although, that may be changing in the near future). Websites like PlentyOfFish also tend to attract people who are interested in a casual date. This isn’t to say that you can’t find relationship-oriented men on these sites, but it’s good to be wary. Consider avenues outside of online dating when it comes to meeting a new partner. According to a study, a majority of successful couples tend to meet through friends. When you are ready to start dating, let your trusted friends know that you are interested in meeting someone. They may have a perfect person in mind to set you up with! Don’t wait to disclose the fact that you have children. If you use online dating, make sure that you mention that you have kids in your profile. The person should know you are dating as a single mom by the first date. If you’re worried that the man will be put off by the fact that you have kids or consider your children “baggage,” keep in mind that this man isn’t the type of guy you want to go out with anyway. There is nothing wrong with being a single parent and it’s not a fact that you should feel pressure to hide — be proud of it! Some people consider dating a person with kids a “deal breaker,” but this is often because they don’t want to have children themselves. Thus, it’s better to know that immediately and move onto someone who is open to dating a single mother. 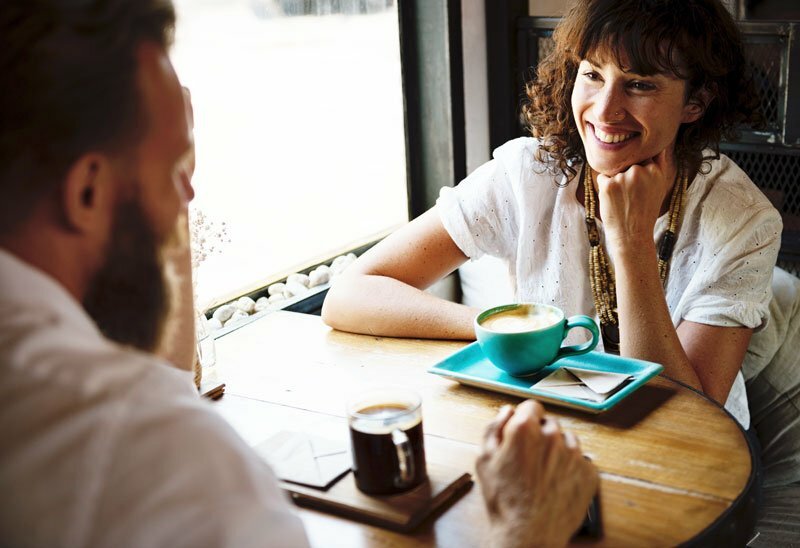 The more open and upbeat you are during a date, the more likely that the person you’re with will be able to connect with you. You may feel uncomfortable when you first get back into dating as a single mom. But remember that dating can be nerve-wracking for everyone. At the end of the day, going out to meet someone new should be a fun, positive experience. If you’re feeling nervous about an upcoming date, you can do some different things to increase your confidence. Try some light exercise, meditate or do a yoga class to center yourself. Want to know a trick to boost your confidence during a date? According to research, even a fake smile can put you in a good mood and increase your confidence. And when you exude positivity (while showing off your pearly whites), you end up putting your date at ease as well. This will make it easier to connect on a romantic level. Obviously, your children are your first priority. It is important that you consider their feelings before you start dating and communicate with them. Allow your children to ask questions and communicate their feelings, stresses or concerns. Always handle these conversations with compassion and kindness. When it comes to dating as a single mom, avoid the dreaded revolving door. Take things slow with romantic partners and wait to introduce anyone to your children until the relationship has become serious. Remember that “adult sleepovers” should only take place at your partner’s house or during nights when your kids are not at home. At the end of the day, whether a date goes well or is downright horrendous (we’ve all been there), be proud of yourself. As a single mother, you take on responsibilities and tasks that veer toward superhero territory. Single moms tend to be some of the most independent, compassionate, strongest and hard-working women out there. Take pride in that. Finally, remember to take things at your own pace. Don’t put too much pressure on yourself when it comes to dating or treats it like a chore. This is an opportunity for you to explore, learn and — most importantly — have fun. A great writer that has a penchant for humor, fashionable scarves, and semicolons; she also enjoys caffeine.